Tropical coastlines are facing increasing risks from coastal storms coupled with degradation of their nearshore shallow reefs. Degraded reefs begin to erode when the live coral cover decreases below a threshold level (between 10% and 15% cover). ref As the reefs become lower in the water column the amount of wave energy they block is reduced. Reef degradation, combined with these rising risks combine to cause greater flooding and erosion. Interest is growing in how best to confront these challenges. Decision-makers often turn to built infrastructure such as seawalls that further degrade coastal ecosystems. Consequently there has been a growing interest in the use of coral reef restoration through substrate addition as a means to meet coastal protection (risk reduction) and conservation management objectives. 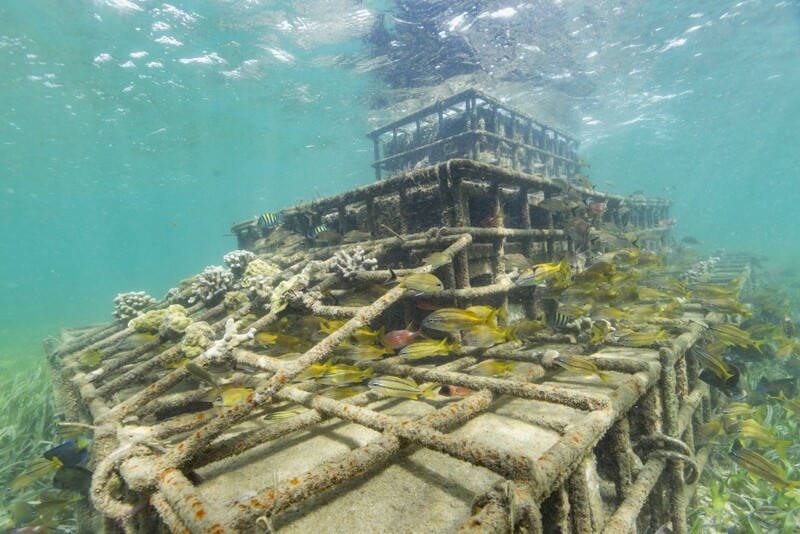 Coral restoration historically used engineered structures to rebuild or stabilize coral reef framework after major damage caused by ship groundings, mining, or blast fishing. These projects often utilized manmade materials (e.g., limestone blocks, rock piles, molded cement, steel, wood, and tires) that failed to recruit reef-building corals onto structures. Modern reef substrate addition projects today use more natural materials, and seek to enhance both ecological health and ecosystem services to people, like coastal protection. In some areas, restoration of the physical environment may be required before biological restoration of the coral and fish communities can occur. Substrate addition, or structural reef restoration, requires working with professional partners such as government agencies and coastal engineers. In many ways, the coral restoration community has a lot to learn from the oyster reef community, which has been addressing structural restoration questions for the past two decades. The following sections provide information on types of structures and methods being used.